Well, you HAVE to vote considering it an obligation. So why have people panicked with this photo of an article printed in News Papers and asking about it ? Should these media houses take permission to make fool, for satire ? “बुरा न मानो, होली है” has been in buzz lately. “Don’t feel bad, It’s Holi” has been in discussion that one should take permission to throw colors on someone, and many also use this as an excuse to harass women. Photo of an article is viral which says that Rs. 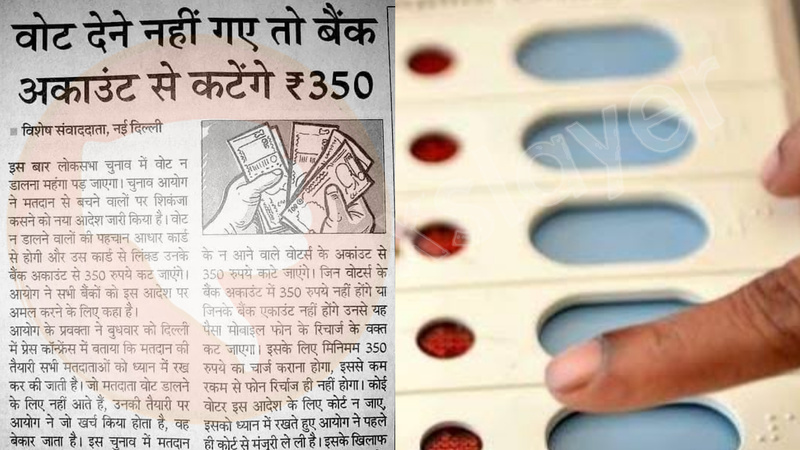 350 will be deducted from your bank account if you won’t vote in coming Lok Sabha Elections. Yesterday’s Newspapers, Hindi Navbharat Times and Marathi Lokmat, printed this in an article along with other news. But like April Fool news printed on 1st April of every year, this also was False and was meant just for humor, or may have a message to make people aware and encourage them to vote. ← Congress handle posts photoshoped image. Will Delhi be hit by biggest earthquake ever ? March 22, 2018 Hoax Slayer Comments Off on Will Delhi be hit by biggest earthquake ever ?